Summary: The Panama Hotel and the novel in which it is featured leads to a lively and thoughtful discussion with junior high students. I recently was asked to speak to several classes of junior high students in the Mercer Island School District in the state of Washington. Students were reading Hotel on the Corner of Bitter and Sweet by Jamie Ford. The novel is a story about a young Chinese-American boy and his unlikely friendship with a Japanese-American girl, and their struggle to maintain their friendship after her family is sent off to an internment camp. The hotel in the title refers to the Panama Hotel, which still stands at the western edge of the International District in downtown Seattle. The structure was declared a National Historic Landmark building in 2006, and designated a National Treasure in 2015 — one of only 60 across the nation. Before WWII, the hotel stood in the center of Nihonmachi, or “Japantown,” which was a thriving hub for Japanese-American businesses, including stores, barber shops, bathhouses, and more. After the mass incarceration of Japanese Americans during WWII, most of Nihonmachi passed to other groups, save for a few exceptions … most notably, the Panama Hotel. Built in 1910 by the first Japanese-American architect in Seattle, Sabro Ozasa, the hotel has been restored to retain much of its historic condition. Many Japanese-American bachelors lived in the Panama Hotel before the war, and since the rooms had no closets, they fashioned wardrobes out of old wooden shipping containers. You may still find old labels from canned vegetables affixed to the back side of their walls. A basement room of the hotel was filled with belongings of Japanese-American families that had to quickly prepare for their “evacuation” to the internment camps. Although some families returned after the war to retrieve their stored belongings, many did not. A Plexiglas-covered hole in the teahouse floor today enables diners to peer down at the items people left behind: luggage, a baby carriage, furniture. It is like looking through a window in time, and one wonders what became of the families who never reclaimed their belongings. I cannot encourage anyone enough to visit the hotel and take a moment to peer through the window in the teahouse floor, if you live near Seattle or expect to visit the city! The daughter of a musician friend of mine attends the Mercer Island Junior High school, and a request was sent out by the school to anyone who might have experience with Chinese or Japanese immigrants in Seattle to come and speak. My friend reached out to me, and after several emails and phone conversations, we scheduled time for me to do a remote session to speak with the students about my mom’s family experience during WWII. I was delighted to receive questions from many students the week before my scheduled talk. Questions ranged from living conditions in the camp to issues of identity, racism, and how we feel about the event in retrospect. I was glad to answer the questions, as well as think about them in preparation for my talk. At the appointed time, through a remote computer connection, I showed pictures of my mother and her family, and pictures from “camp.” With only a half hour per class, I had to limit my talk primarily to the period of incarceration. 1. Interview your parents, grandparents, aunts and uncles. I never knew my grandparents. They died around the time I was born. The only reason I know these stories is because my mom collected them and laboriously hand wrote, then manually typed them, and shared them with me. Today, it is so easy with a cell phone to audio- or video-record a relative. Ask the person about his or her life growing up. Be persistent! You will be grateful to have the stories and recordings later! 2. Stand up and speak up for what you know to be right. My mother often says it was not the mean, racist people who hurt her and her family the most. Rather, it was the many people who stood by silently and allowed the mistreatment and injustices to occur. I told the students I believed they knew right from wrong, and encouraged them to speak up when they saw something wrong. Whether it happens at an individual, community, or nationwide level, speak up! Don’t let anyone try to persuade you that your voice does not matter. I was happy about the reception I received from the classes and the thoughtful questions the students posed. I was also delighted to receive personal messages a week later from the students thanking me for the talk. Many wrote how much more meaningful I had made the history for them. Learning a personal story helped them understand much better what had happened and why it was so important to not to forget. At least one also indicated his intention to interview his parents. That really made me happy! History is sometimes taught as a random collection of names and dates, and it often glosses over or completely skips its darker chapters. I was glad to speak with the students, and left the experience with renewed hope for the future. Yesterday, February 19th, was the Day of Remembrance. 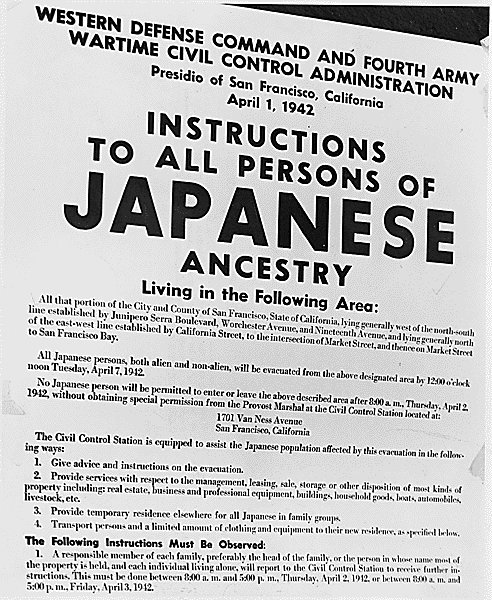 This is the day in 1942 when President Franklin D. Roosevelt signed Executive Order 9066. It is the date when Japanese Americans remember this disastrous and dangerous Executive Order and its impact on our families, our community, and our country. It is an opportunity to remind ourselves of and educate others on the need for constant vigilance to prevent fear and xenophobia to be twisted and manipulated to undermine and attack our civil liberties and Constitution. I am often asked about my mom’s family’s experience as Japanese Americans during WWII. Mom was a 4th to 6th grade girl when her family was forced from their home in Hood River, Oregon, and sent to Tule Lake, CA, for one year, then Heart Mountain, Wyoming, for 2 more years. Four of her brothers served in the US armed forces in the Pacific theater. Below are links and recommended readings on the subject. I continue to update my list. I have published its current version here for the easy access and sharing by others. The list contains general information as well as links to personal pictures and stories. 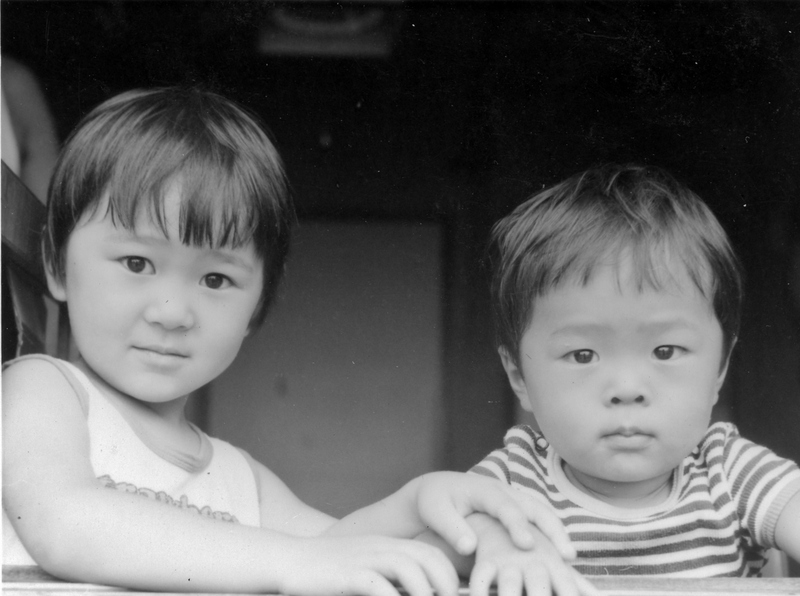 Here are 22 pictures showing step-by-step the story of my mother’s family’s internment. It is public so even people who don’t use FB can view it. Here are three YouTube videos of talks mom made in the last few years. They are about 1.5 hours each. Mom’s 2017 talk at Old St. Francis School, Bend, OR – Click “more info” for a list of topics and clickable time stamps. This talk was unique in that it was an interview between my oldest brother and mom, and a question was posed to him and me at the end. Mom’s 2014 talk at Edgefield – Mom gave a talk a couple years ago on Aug, 2014. I made my own slideshow to go with it. Although the sound isn’t the greatest, I think you’ll find it interesting. It is almost 1.5 hours long, and there are clickable table of contents timestamps under “show more”. The Legacy of Heart Mountain – excellent 24 minute documentary. Mom and her family were here for two years. Order 9066 Podcast – An excellent 8-chapter (plus bonus episodes) podcast I recently discovered. It covers many facets from the lead up, the announcement, the rounding up, men who enlisted, men who resisted, and the post-war experience. Highly recommended! Renunciation Act of 1944 – The government wanted to deport the perceived “troublemakers,” especially among the more active and vocal prisoners at the Tule Lake camp, but you cannot deport US citizens. So Congress passed this law to allow people to renounce their citizenship. In the fog of war, insulated from news, mail censored, and so on, nearly 6000 people chose to renounce, effectively become citizens of no country. Wayne Collins – Wayne M. Collins is the late, great lawyer who fought tirelessly for 20 years to overturn the renunciations of thousands of Japanese Americans. Wayne Collins’ son’s talk – Collins’ son gave a barn-burner of a speech which I recorded at the 2014 Tule Lake Pilgrimage. The audio is mediocre. The grade school daughter of a classmate of mine read a story about a Japanese American girl who was sent to an internment camp. Her classmates and teacher had a bunch of questions, so I invited them to write them out and send them to me. They did, and mom and I answered them. Here is their questions and our answers. 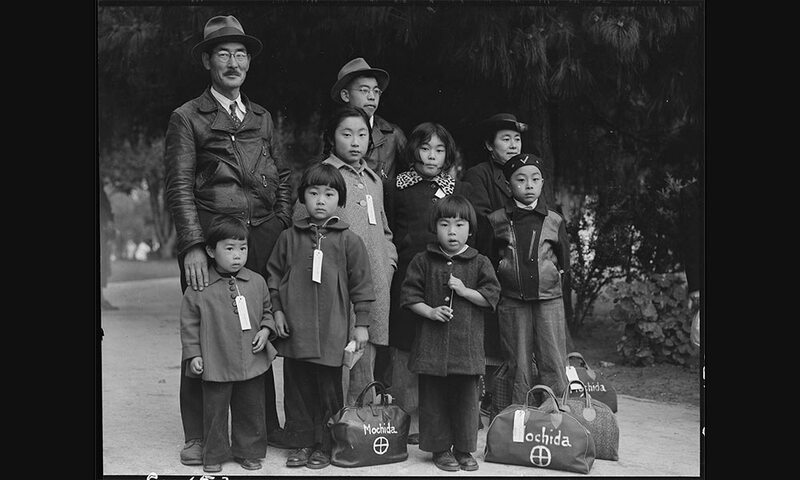 Oregon Senator Merkley proposed the “No Internment Camp Act” (S.3567).” I wrote an op-ed in favor of this bill and collected the signatures of 18 family members. It was published in the Medford Mail Tribune on Sunday, November 10, 2018. You can read it here. Tule Lake by Ed Miyakawa – a novel based on history of the Tule Lake camp, which became one of the most notorious of all the camps including a stockade and tanks, and where torture and uprisings occurred. Ed is an architect who lived in Newport, OR many years and designed some major buildings and private homes there. He now lives in WA and with his wife have adopted and raised many special needs children from around the world. Hotel on the Corner of Bitter and Sweet by Jamie Ford. This novel is about the Panama Hotel in Seattle, which you really should go visit. Many Japanese American bachelors lived in the hotel, and the tea room there has a hole in the floor with glass where you can see a room where families stored belongings before they were quickly shipped away to camps. Looking through that hole is like looking back in time nearly 80 years. Nisei Soldiers Break Their Silence by Linda Tamura. 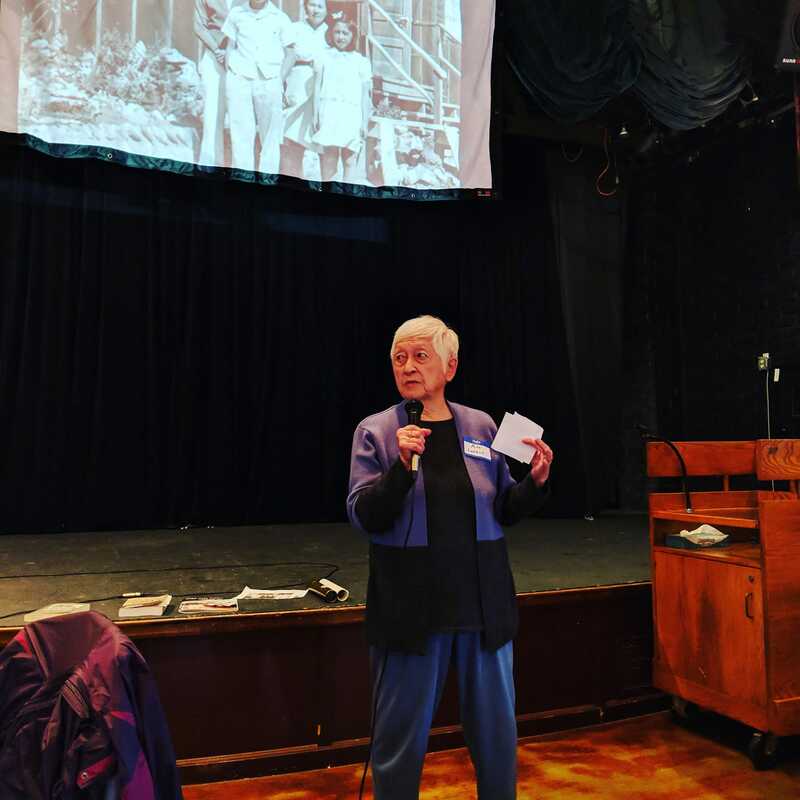 Linda grew up in Hood River (where my relatives live) and interviewed many Japanese American soldiers about their experience, especially the racism they experienced when coming home after serving. The cover photo shows 4 men, 2 of whom are my uncles. Linda has written many books on the subject and they are all good. Stubborn Twig by Lauren Kessler. This is the story of Min Yasui, a young Japanese American lawyer who fought the constitutionality of the anti-Japanese American restrictions all the way up to the Supreme Court. He lost the case, but in 2015 was posthumously awarded the Presidential Medal of Freedom – the only Oregonian, I believe to receive this award. The Oregon legislature voted in 2016 to make March 28 “Min Yasui Day.” The Yasui family was friends with my family (the Asai family). Just Americans: How Japanese Americans Won a War at Home and Abroad by Robert Asahina. This focuses on the military exploits in both the European and Pacific theaters by Japanese Americans. The exploits of the famous 442nd Infantry Regiment, comprised entirely of Japanse-Americans, the most decorated unit in U.S. military history are just few of the stories. The late Senator Dan Inouye was a member, and he lost his arm during the heroic and bloody battle at Colle Musantello. I don’t think I’ll ever forget his story recounted in this book. Made in Japan, Settled in Oregon by Mitzi Asai Loftus. This is my mom’s book and tells the story of my grandparents coming to the US, raising 8 kids, and living through WWII. It’s out of print and hard to get a copy of. My oldest brother and I are working on updating it and republishing it. The fortune cookie is the standard offering that concludes most Chinese restaurant meals in the U.S. I never thought of it as being any more authentically Chinese than faux-Chinese dishes like Chop Suey. “Well, it’s a cookie that is folded…that contains a piece of paper…um…that tells you your future…” You can probably picture the blank stare I received from the befuddled waitress. Yesterday, almost three decades later, listening to Episode 182 of the 99% Invisible podcast, I learned about the surprising origin of the Chinese fortune cookie: Japan! In “A Sweet Surprise Awaits You“, I learned that fortune cookies originated in Kyoto, Japan. Bakers today still make them by hand near the Fushimi Inari-Taisha Shrine. The cookies are called tsujiura sembei (辻占煎餅 – “fortune rice cracker”), or suzu sembei (鈴煎餅 “bell rice cracker,” since they are shaped like the bells you might see in a shrine or temple). Here are Japanese fortune cookie. Note the person hand-folding them in the upper left corner. So how did they become associated with Chinese restaurant meals in the US? During the early 1900s, Chinese restaurants had to create dishes that appealed to American palates, and quite a few Chinese restaurants were owned and operated by Japanese people. 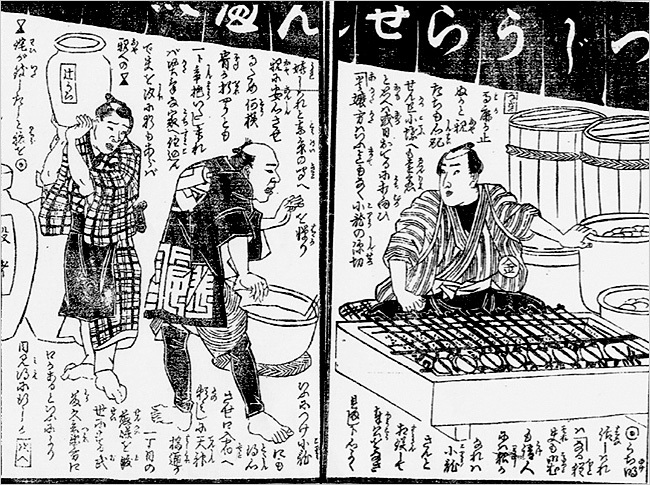 This was decades before anyone in the US outside of Japanese circles knew about sushi. The fortune cookie was likely introduced into the Chinese restaurant offerings by Japanese people. During WWII, 120,000 people of Japanese ancestry on the West Coast were driven from their homes and businesses into concentration camps. During that four-year period, whatever weak connection between the fortune cookie and its Japanese origin was completely lost. Chinese-Americans invented machines to manufacture the cookies (previously folded by hand), and wrote, printed, and cut thousands of fortunes printed in English. According to the podcast, fortune cookies have spread around the world (I wonder if I might find them in Germany now?). Ironically, one country from which they are still conspicuously absent: China. I made a short visit to Nagasaki a couple of weeks ago as one stop on a two-week cruise I made with my mother. Here are my notes. I was happy to see Nagasaki. It had been nearly 1.5 years since last I set foot in Japan. That and the fact that I’d never visited Nagasaki made me all the more eager. Also, visiting Hiroshima had had such a deep impact on me, I anticipated another meaningful experience in Nagasaki. Nagasaki (長崎), whose name means “Long Cape,” has a rich cultural history. It was an early trading port with the Portuguese and Chinese, and has a colorful and sometimes dark history involving Jesuit and Catholic missionaries, Christianity, and evangelism (some of which was dramatized in a 2016 film, “Silence”). Nagasaki is also the setting of Puccini’s popular opera, “Madame Butterfly.” At one time, this city was the single port open to the world from an otherwise completely closed society. 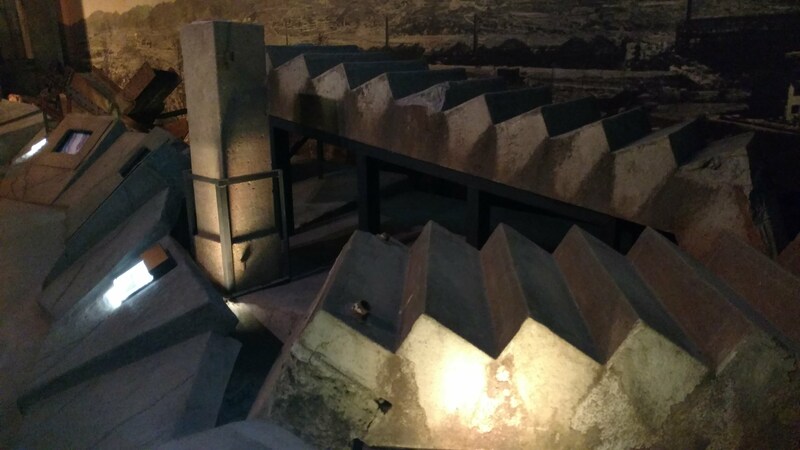 When the Meiji Restoration finally opened all Japan to outside trade and diplomatic relations in the second half of the 19th century, Nagasaki became a center for heavy industry, particularly ship building. Mitsubishi Heavy Industries was one of the major builders of the Imperial Japanese Navy during WWII, which is one reason Nagasaki was placed on the list of potential targets for an atomic bomb attack. Rebuilt after the war, the city still builds ships, and was the birthplace of several of cruise ships for the company I traveled with. Upon arrival, I couldn’t help but notice a few things that were unique about our experience here compared to other Asian ports. There was the usual long queue of people waiting for passport control and customs. But instead of standing in the morning sun, we enjoyed the shade of long, covered breezeways. 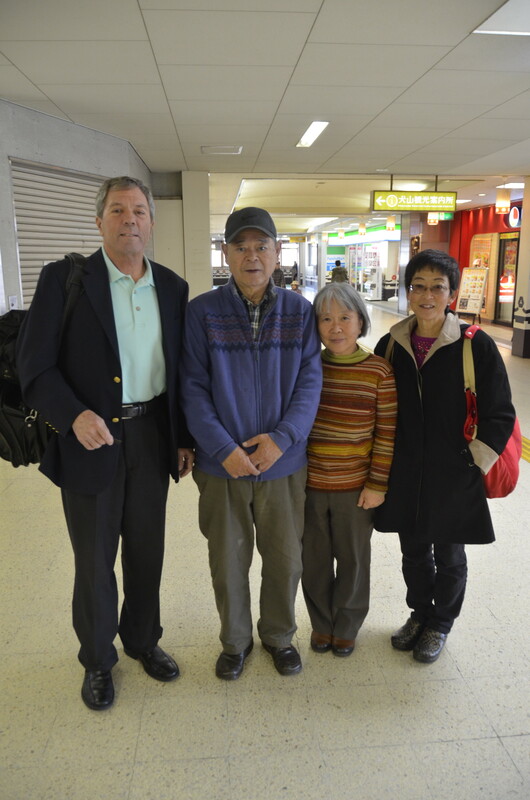 We were processed quickly and courteously, such was the thoughtfulness of our Japanese hosts. Also, when we left port, a group of well-wishers stood on the dock and bade us goodbye. My first destination was the Glover Garden and Glover Residence. Thomas Blake Glover was a Scottish merchant, and his house is an interesting mixture of Western and Japanese design and construction. Flowers, a koi pond, and statues of Puccini and Miura Tamaki (a famous Japanese opera singer who performed in “Madama Butterfly”) decorate the grounds. We were lucky to see some flowering cherry Sakura as well. The residence and garden are located on a hill overlooking the harbor. It was not distant from the harbor, but we had to climb steps and steep narrow streets to reach our destination. 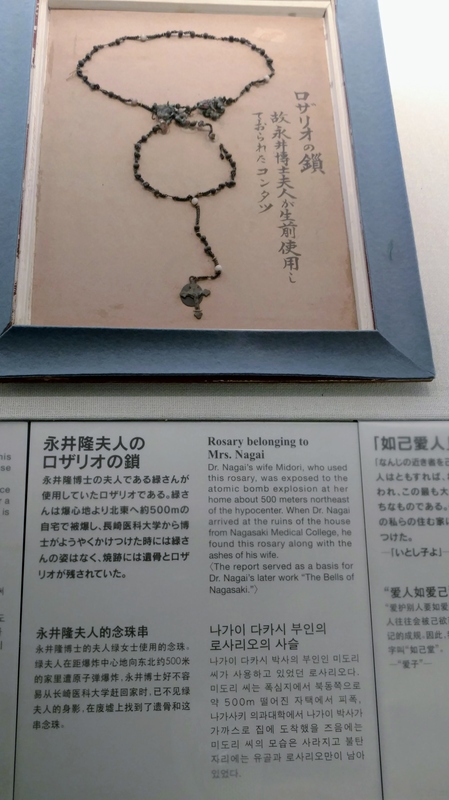 My primary goal was to visit the Nagasaki Atomic Bomb Museum. 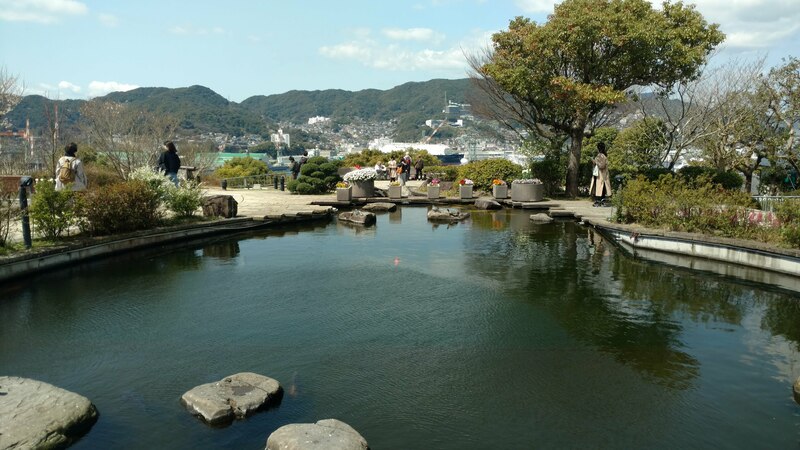 It is about 6km north of Glover House, and, given the steepness of the hill we had climbed and the limited time we had in Nagasaki, we chose to get there by taxi. The ride took about 20 minutes and cost about 1200 yen (approx. US$12). We entered the museum and rented audio tour devices. Similar to the audio tour guides in Hiroshima, the commentary was delivered by a native English speaker in a neutral, dispassionate tone. Such lack of modulation only made the horrific facts and figures all the more stark and gut-wrenching for the listener. 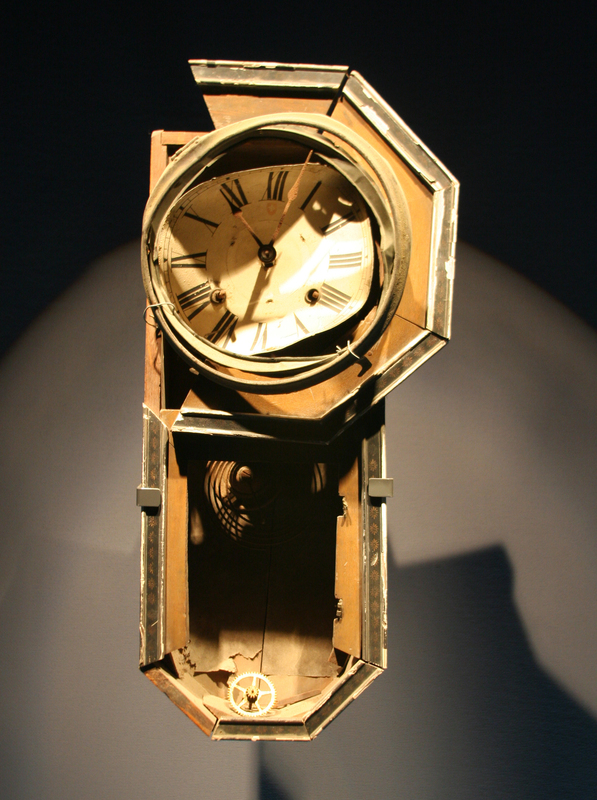 In the entrance to the museum stands a broken clock, its hands frozen at 11:02, the moment on August 9, 1945, when the second atomic bomb, nicknamed, “Fat Man,” was dropped. At the time, the population of Nagasaki was about 263,000. Between 35,000 and 40,000 people were killed instantly, and 20 neighborhoods within a 1km radius were destroyed. The subsequent fires and winds destroyed 80% of the homes within a 2km radius. Although “Fat Boy” was more powerful than the atomic bomb dropped three days earlier on Hiroshima, Nagasaki’s uneven terrain limited the damage. The first room was dark and filled with the rubble of collapsed concrete stairs, toppled pillars, and blackened stones. At the far end stands a replica of the destroyed Urukami Cathedral. 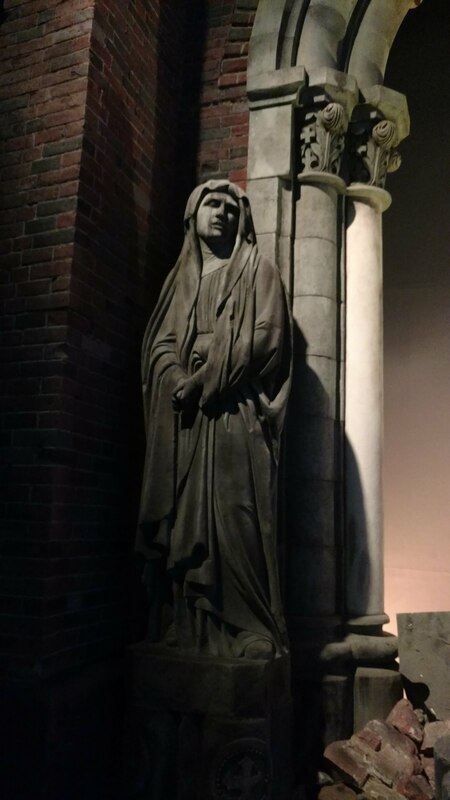 Blackened statues of Mary and Christ stand on either side of an arch. The cathedral was only 500m away from the hypocenter and was completely destroyed. 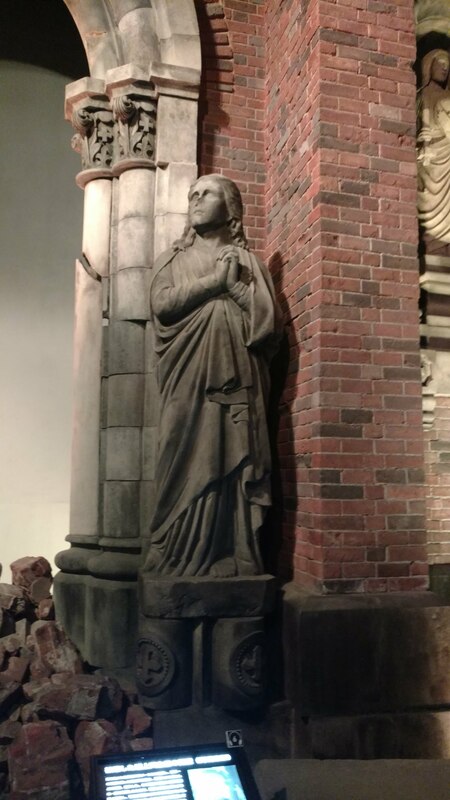 The statues in the museum are replicas, because the originals now stand at the UN headquarters in New York City. 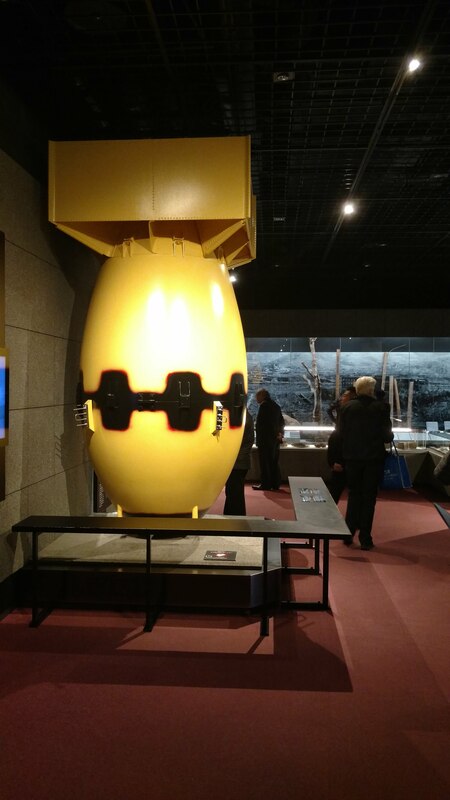 There was a full-scale model of “Fat Boy.” As with the bomb that fell on Hiroshima, only a fraction (1kg out of 6.4kg) of the plutonium it contained achieved nuclear fission. The rest was scattered in the blast as radioactive debris. One can only imagine how much more efficient modern weapons must be and the corresponding devastating power they are capable of. 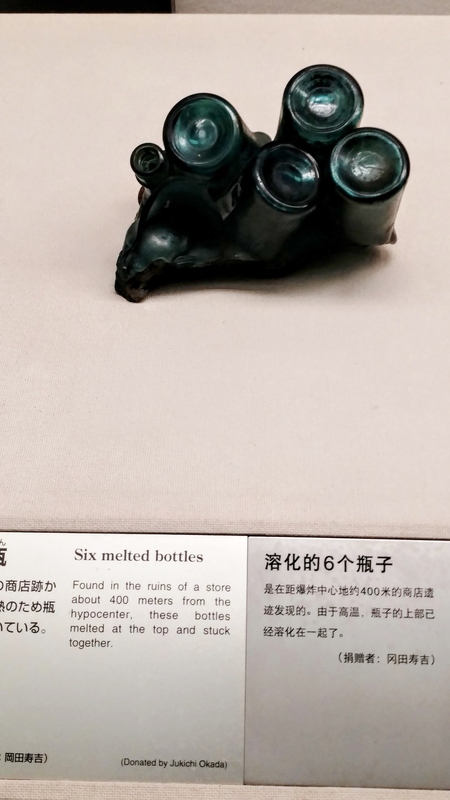 There were blackened stones, melted bottles, and other artifacts, but three items hit me the strongest. The first was the lunchbox of a 14-year-old girl. 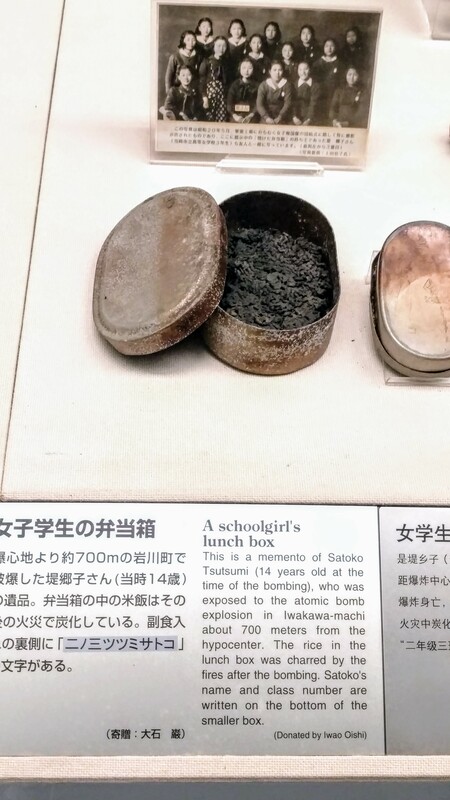 Satoko Tsutsumi was 700 meters from the hypocenter, and her lunchbox is all that was found. In it is the blackened, carbonized rice for her lunch. The only reason they knew it was hers was from the name and number on the box. I believe no other remains were found. I cannot help but wonder: Were her parents killed instantly, as well, or did they survive only to witness and experience the horror of her disappearance? The second was a silhouette of a lookout and his ladder on a wall. 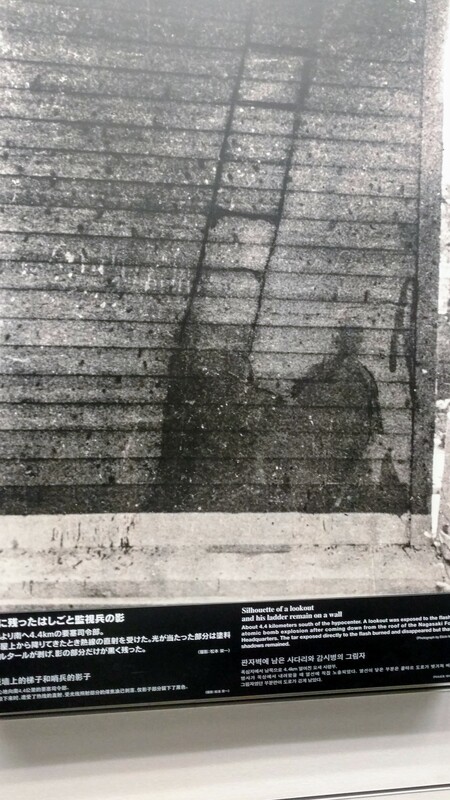 4.4 kilometers from the hypocenter, the tarpaper burned away from the wall, but the ghostly image of this man and his ladder remained. This image haunted me, reminding me of the horrors I had seen in Hiroshima, and also of an ghastly scene from Ray Bradbury’s short story, “There will come soft rains,” in which the image of family members, in the midst of their carefree day, have been burned into the wall by an atomic blast. These are the bells that did not ring for weeks or months after the disaster. May there never be a time when they do not ring! May they ring out this message of peace until the morning of the day on which the world ends. As the museum tour ends, one is returned back to where it began. 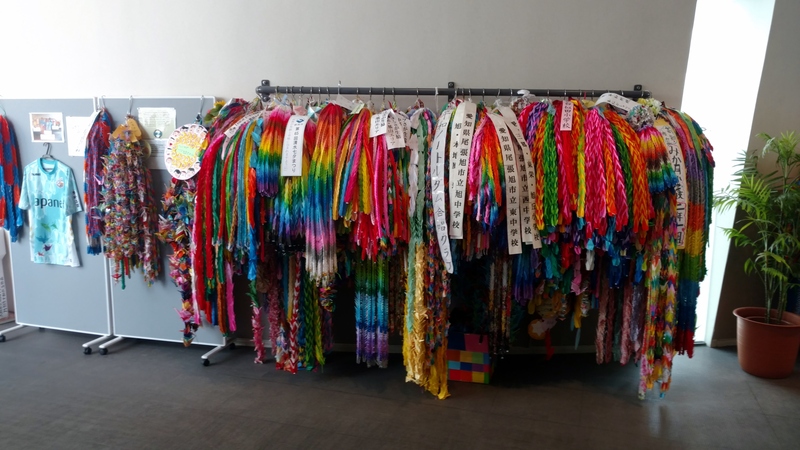 Thousand-crane offerings folded by children from around the country and the world are hung from strings or arranged into elaborate mosaics to beseech the world for peace and for the end of nuclear weapons. 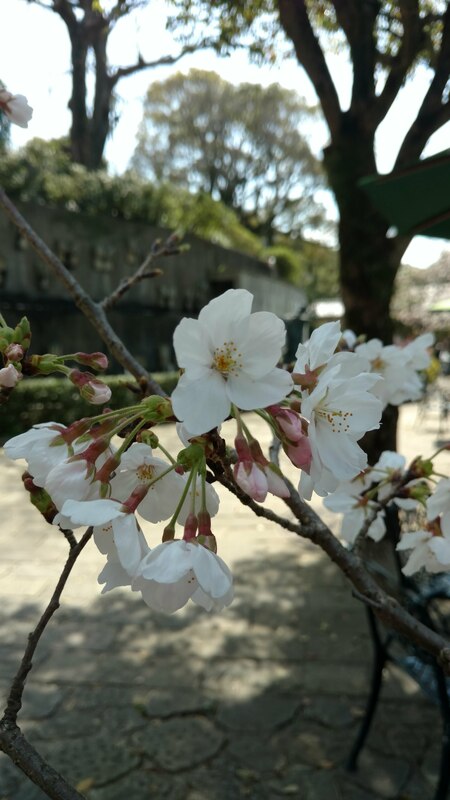 Returning to the ship by taxi, I was struck by the contrast between the beautiful, sunny day, and the blooming flowers and cherry blossoms, versus the dark, sorrowful scenes I’d witnessed in the museum. When we distance ourselves from the humanity of others, using facts and figures, stereotypes, caricatures, and assumptions, it is easier, I think, to accept and support war and the terrible methods and tools we have to wage it. When we learn the stories, imagine the suffering if we had been in a similar situation, and think of the countless innocent civilians and children inevitably killed in war, then, I think, we cannot accept without question the “need” for war and the “need” for these horrific weapons. It has been over a year since my last entry. I am moved to post for two reasons. First, I’m about to embark on a cruise to several Asian cities, including Nagasaki; and second, I saw an article about race and Japan that saddened but did not surprise me. Thus far, the vast majority of my entries have been very complimentary of Japan and its culture. Indeed, there are so many laudable facets about Japan and its society from which we and other cultures could learn. I believe the only negative entry I’ve written thus far had to do with pollution. As I think may be true for countries and individuals, one’s strengths can also be one’s challenges. The US has a highly diverse population compared to that of many other countries. Our diversity is a great strength, but it is also the soil out of which seeds of discontent may feed racism. Other nations that have fairly homogenous populations may experience much less racist friction and outright violence, but the racism is still often present, though expressed in different, subtle ways, and often left unspoken or unchallenged in the absence of advocates for broader understanding and diversity. Japan is one of the most homogenous societies in the world. Legal foreign citizens comprise only 1.6% of Japan’s population. The largest populations of legal non-Japanese residents are from China (.52%), and S. Korea (.42%). The next largest groups, from the Philippines and Brazil, respectively, each represent less than .2%. Given tiny foreign populations and a restrictive immigration policy, as well as a strong cultural sense of group and national identity, it should not be surprising that someone different might be regarded with curiosity or suspicion. During my three trips to Japan, my height and appearance may have drawn stares, especially in smaller towns. I have heard stories about redheads in Japan being pointed at and people wanting to touch their hair. During my trips, I cannot recall seeing a single black person. My year in Germany in the late 80s includes tainted memories as well. I rarely saw black people then; and the casual, off-hand comments and jokes I heard people voice about blacks often made my blood run cold. A black writer who is married to a Japanese woman and raising a biracial child describes what it is like to live as a visual anomaly in such a homogenous society. I will soon visit the city on which the second atomic bomb was dropped. Feelings of “otherness” and racism are significant factors in major conflicts and wars. 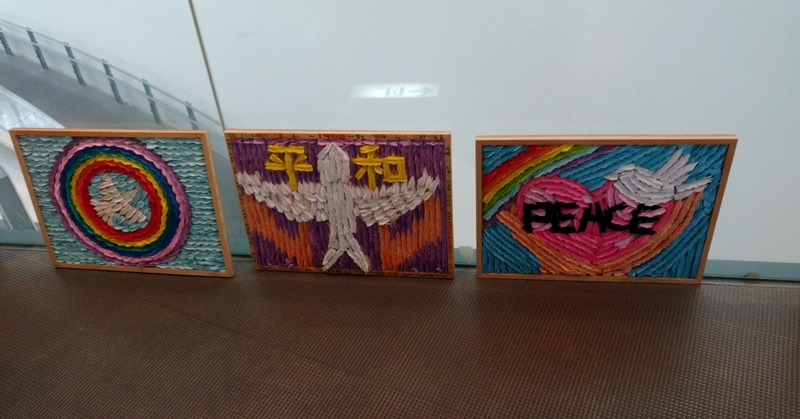 In the 60 years that have elapsed since the two atomic bombs were dropped, Japan has been a major voice for peace and understanding in the world. 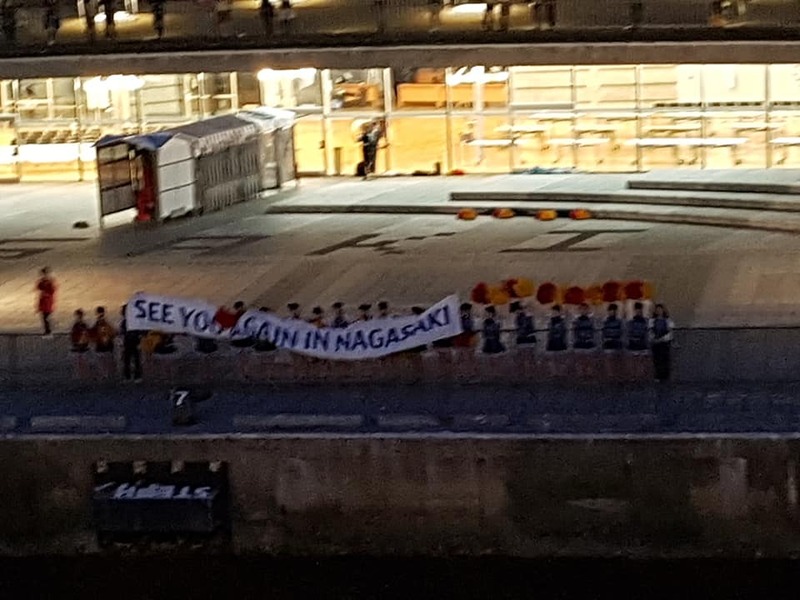 Nagasaki is also the birthplace of Ariana Mamiko Miyamoto, who was crowned Miss Universe Japan 2015 and represented Japan at the Miss Universe 2015 pageant where she made it to the Top 10. Since she had an African-American father, her crowning elicited controversy, and as a child she was shunned. Her dark skin and curly hair was too “other” for children and many adults to accept with equanimity. But when another biracial friend committed suicide, Miyamoto decided to dedicate her life to combating racial prejudice. My visit to Nagasaki will be brief. But like my visit to Hiroshima in 2015, I anticipate strong feelings relating to identity, race, peace, and compassion. Race is an area in which Japan and Japanese society, which I appreciate and respect so much, may yet have a lot to learn from other countries. Summary: Visiting the Nabano no Sato to see the brilliant display of nighttime lights, enjoy a wonderful meal, and the natural hot springs. Our cousins in Nagoya took us on a day trip to Yatomi, about 30 kilometers southwest of Nagoya. Here we visited my aunt’s grave, met a distant cousin and toured his rice and produce warehouse, and enjoyed some tea. Then our cousins drove us to Nabana no Sato in Kuwana, just a couple of kilometers from Yatomi on an island in the Kiso river. There was some vague talk about flowers, and nighttime illumination. The area was known to my mother, who remembered her own parents talking about the hot springs in the area. I had hoped there might be a public bath (onsen). As was often the case, we just went along, eager to see whatever it was our hosts wanted to show us. We arrived around 4:30 p.m. when the light was already fading. On the drive to this place we saw a large amusement park with roller coasters and rides, all shut down and closed for the winter. That is part of the Nagashima Resort, a sprawling complex of amusement rides, water slides, flower parks, outlet malls, and more. The Nabana no Sato flower park is just one part of this overall resort. Along the walk to the entrance, the trees and bushes were covered with twinkling lights. We purchased our tickets and entered the park as the natural light gave way. Although there were some lights on, most of the park we could readily see was not. We were told to wait until 5:10pm, which was when the lights were to come on. That was just a few minutes’ wait. And it was worth the wait. The bell tolled, and voila, thousands and millions of lights came on, to illuminate the flowers, plants, and trees as far as one could see. Here is a video of the moment of illumination. At first we mostly saw the tiny LED lights come on. 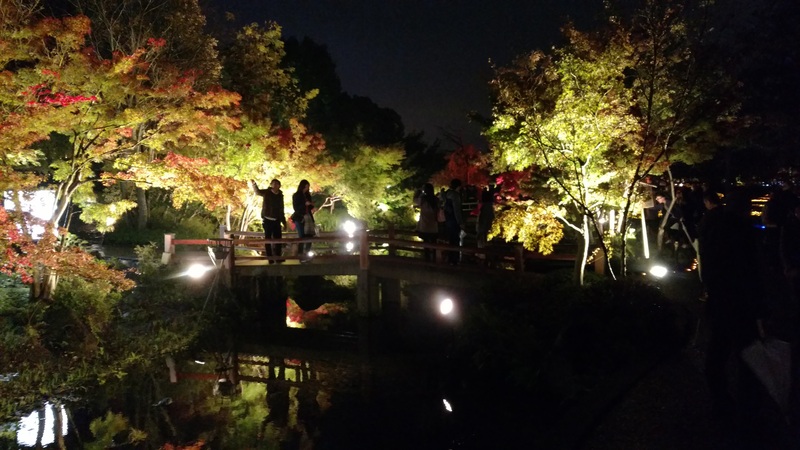 In the distance, we could see trees in their autumn foliage illuminated by spotlights from below. We strolled through the park and marveled at the colorful display. Over the park sound system, Christmas music played. This was a little jarring to me because it was still only early November, and I had to chuckle a bit at the irony of hearing “Silent Night” broadcast over acres of park. There were two long illuminated tunnels. The first was all white lights and about 100 meters long. People walked through, smiling and taking pictures of each other as they were mesmerized by the spectacle. A second illuminated tunnel was lit by autumn-colored lights. These changed colors between red, gold, green, and orange. Walking through that tunnel was a little unsettling. When the whole tunnel would shift colors, I felt a slight vertigo. Here’s a video of the autumn tunnel. Examining the walls of lights closely, I saw the tiny individual LEDs were not changing color, but in each cluster of lights, there was a red, gold, green, and orange light. I concluded that my eyes and body were fooled into thinking my surroundings were moving whenever the lights changed, similar to the odd feeling one sometimes has in a stationary train or bus when a vehicle next to you pulls away and fools you into thinking you are moving backward. At one spot there was a large panoramic wall of LEDs formed into a tight matrix. Synchronized with music, the wall presented changing visions of waterfalls in a lush jungle, southwest desert sunsets, penguins on an ice floe, and a nighttime scene illuminated by moonlight. Here is a video of the panorama light show. Note that these are not projections, but actual images generated by a tight, coordinated matrix of multicolored LEDs. 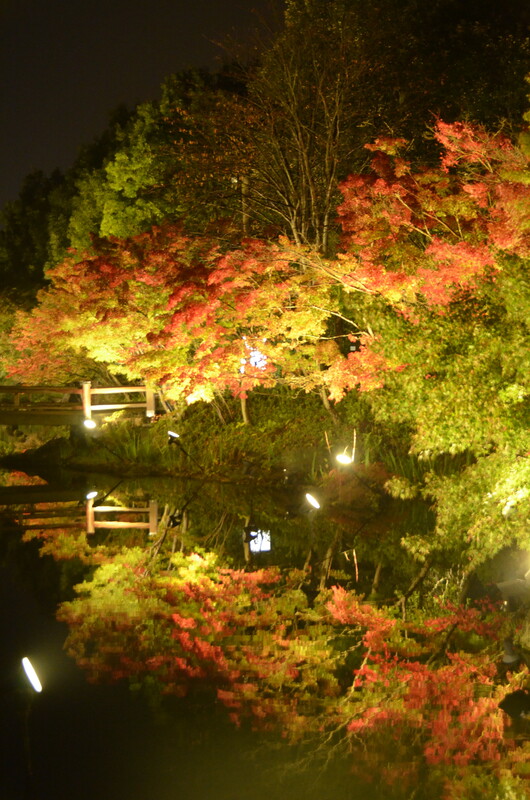 In another area there were beautiful fall trees of gold, red, and orange, illuminated from below and reflecting mirror-like in pools of water beneath them. A round, elevated observation deck towered over the park. From a distance, it looked like a small version of the Seattle Space Needle, but supported by a slanted pillar. It turned out to be a cantilever arm: As we walked through the park, we saw it rise slowly into the sky, then lower itself to the ground. I wanted to wait in line to take the ride up and see the view, but the weather was cold and our party a bit tired and hungry, so we passed that up. We stepped into a restaurant in the park and were happy for the warmth and the rest after so much walking. 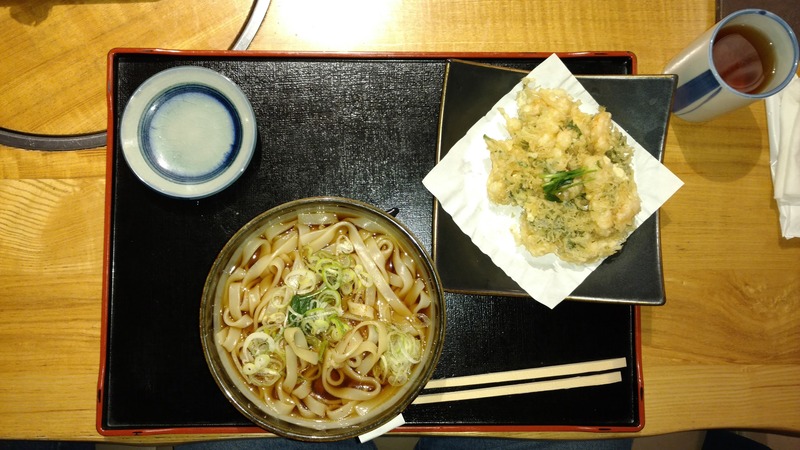 Dishes of noodles and tempura accompanied by wonderful tea warmed our stomachs. Afterward, we walked over to the Sato no Yu natural hot spring baths. We separated by gender, disrobed, and showered, then enjoyed the many different pools, most of them outdoors. The water was plenty hot, and it soothed our muscles after the long day of sightseeing and walking. After getting home, I found that illumination parks during winter have become popular in Japan and such displays have been established in many areas. I don’t know for sure, but Nabana no Sato may be the largest. It reportedly features more than 8 million LEDs. 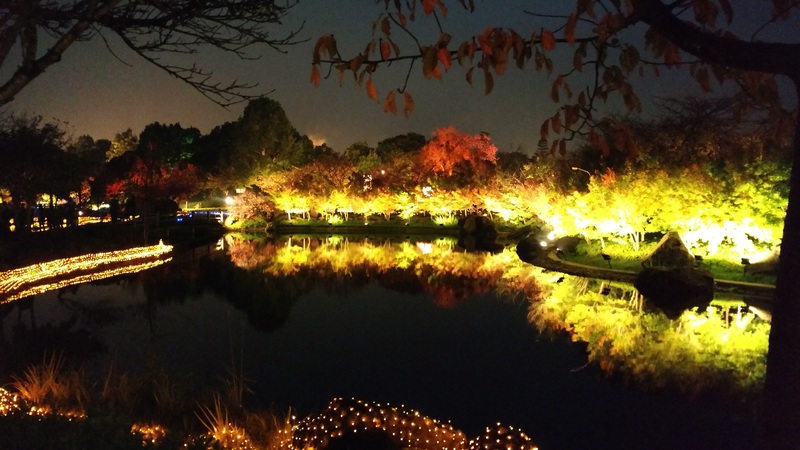 The Nabana no Sato illumination park is open from mid-October to early May. It is only 40 minutes by bus and 20 minutes by JR rail from Nagoya. I highly recommend a visit if you can make it. Summary: Visiting my eldest cousin, his tragic and dramatic life story, and giving thanks for the many bonds between his family and mine. I have written a little bit about my eldest aunt, Masako-san, who died in World War II during the firebombing of Nagoya, and whose gravestone, erected by my grandfather, I sought out last year and revisited again this year. She died with her two infant children. But her first child, a son, still lives. He is the eldest of all my first cousins, and I am the youngest. The fact he survived the war and lives today is a story that could easily be made into a novel or drama, and I feel very fortunate and blessed to have met him and his family. Here is his story, much of which is contained in a chapter of my mother’s book Made in Japan and Settled in Oregon. My eldest aunt, Masako, was born in Hood River, Oregon, where my grandparents were growing fruit. When she was an infant, my grandparents brought her to Japan. My grandfather’s mother said, “A girl will be of no use to you on a farm. Leave her here in Japan so she can get a proper Japanese education.” No doubt it broke my grandparents’ hearts to leave their daughter (and oldest child), but in that day and in that culture, one did what one’s parents ordered without question. So Masako remained in Japan. She grew up, despite my grandfather’s requests that she be returned to the U.S. The alleged response to his requests was: “You can’t send a young woman alone across the ocean!” So Masako never left Japan. She married, and then the war broke out. Her husband was in the army and sent to Manchuria, which was basically a death sentence. And she was pregnant. She gave birth to a boy, which greatly distressed her in-laws, who did not want her to receive her husband’s inheritance. So one day, they came to her home and asked Masako-san where her uncle was. She answered that he was working out in the rice paddies. “Go fetch him,” they said, and Masako left to do so. While she was away, her relations by marriage took her infant son, fled, and adopted him out to a family on the north coast of Honshu. Heartbroken and ashamed, my aunt moved from the small town to Nagoya, remarried, had two children, and was killed trying to rescue her babies when a U.S. firebomb fell on her house. After the war, my grandfather traveled to Japan to erect a gravestone for her, which I visited the last two trips I made to Japan. Her orphan son, Katsumi-san, survived the war and lives today in Inuyama. He did not learn he was adopted until he turned 18. My mother was the first person in our family to meet him. 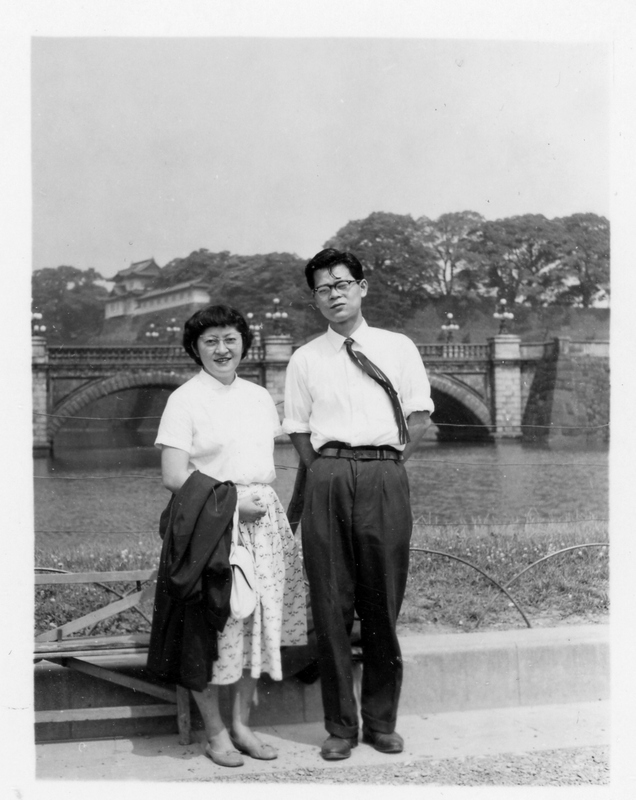 In 1957, she received a Fulbright scholarship to teach in Japan, and that was when they met each other. He is only 6 years younger than my mom, since he is the first child of the oldest of the eight children my grandparents bore, and Mom is the youngest of the eight. Mom was also the first to meet his fiancée. Their first child, a daughter, is named after my mother. I first met my cousin and his family 19 years ago when his daughter, Mitsuko-san, got married. I am grateful to have met them all on each trip I have made to Japan. We visited Katsumi-san briefly last year, and this year spent more time with him and his wife, touring Inuyama, visiting the Sugihara Museum and singing karaoke. Our family history contains some rich and dramatic stories, and I am grateful to have gotten to know and meet some of the relatives who played a role in these stories. I hope you sit down and talk with your relatives, record and video these interviews, and learn the stories of your family. You will be grateful, I assure you.